Retro(spective) | Video games, comics, sports, politics, life, and more. Video games, comics, sports, politics, life, and more. A friend of mine made a blog post on WordPress the other day and it reminded me just how much I need to write. “Need” as in “require”, as in my body physically has to pull words from my brain through my fingertips and onto a computer screen or I run the risk of physically shutting down. Looking now at Retro(spective), however, I’ve come to realize that its narrow focus no longer can serve my needs, so it’s being retooled. I need somewhere to sit and wax poetic about video games, of course, but also politics, sports, art, comics, and everything else that my mind might turn to and need to say something about. So here it is… the all new Retro(spective). Let’s see how regular a thing I can make this! So, it’s been a long, long time since I’ve updated on here, but it’s a semi-special occasion; I just finished my first art show! It was called Press Start, and it focused exclusively on the intersection of gaming and art. I’ve put up a couple of pieces from the show in the Gallery link, and I’ll get around to showing some more work from it, soon. 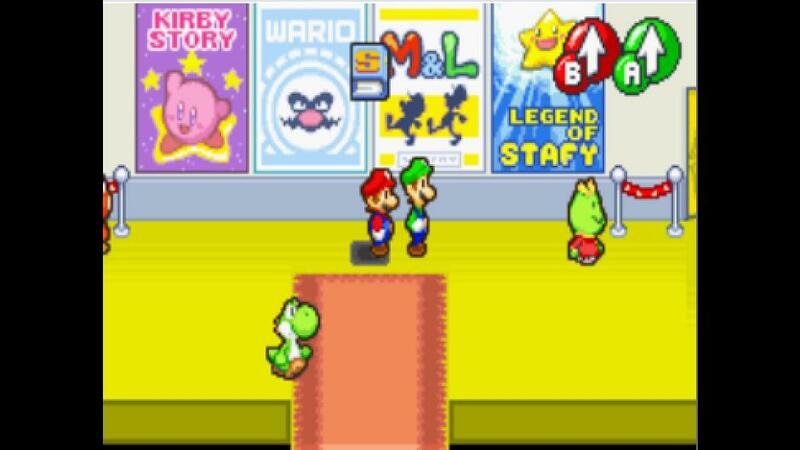 I also hope to get something about Press Start up over on Nintendojo, but no promises! Game Boy is one of my all-time favorite video game systems. Portables have a special kind of magic to them; it’s almost like their diminutive nature creates a more personal connection between player and console. Anyone who’d like an overview of the Game Boy line, including its history and the evolution of the line, as well as a look at its failed competitors, please give the links below a read. 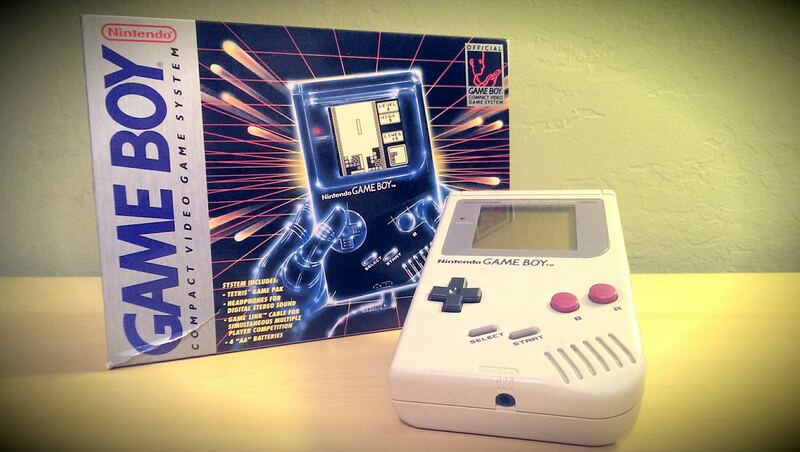 It’s some fairly comprehensive information on all things Game Boy! Been a minute and some change since we’ve all (five of us) chatted it up. If any of you follow me on Nintendojo, you’ll know that I’ve been far from sitting on my laurels, but my production here has been sadly abysmal, of late. There is a very good reason for this; actually, there are several reasons for this, so let me explain. First, school (which is proving to be more intensive in the summer than I was expecting!). Second, Nintendojo (they’re priority number one, without a doubt!). Three… is a secret. Shhhhhh. TOP secret, I should add. It might actually be priority number one, now that I think about it, but there’s no point in quibbling-it’s big. So big, that things will continue to be a tad quiet around here for the foreseeable future. I will make a promise, though, and say that my super secret project I’m working on will be announced here when I finally do decide to make it known to the good people of the intertubes. Being real, for a moment, if not FOR Retro(spective), I wouldn’t even have the opportunity to work on what I’m doing right now, so I have to tip my hat to all my WordPress friends out there. Please bear with me in this crazy busy moment of my life. Retro is far from dead, far from done. Until things quiet down, I’m going to continue updating the Published tab, so if you’d like to keep up with my Nintendojo work, be sure to head there! Frankly, if you like what I type here… it’s not that different from the website. More updates as I have them. Have a good summer, everyone! And don’t worry, the big reveal will be worth it when you finally hear about it, I promise! I will tease you a bit and say if you’re a fan of classic Nintendo… you WILL want to know what I’ve been working on! Whoo, buddy. 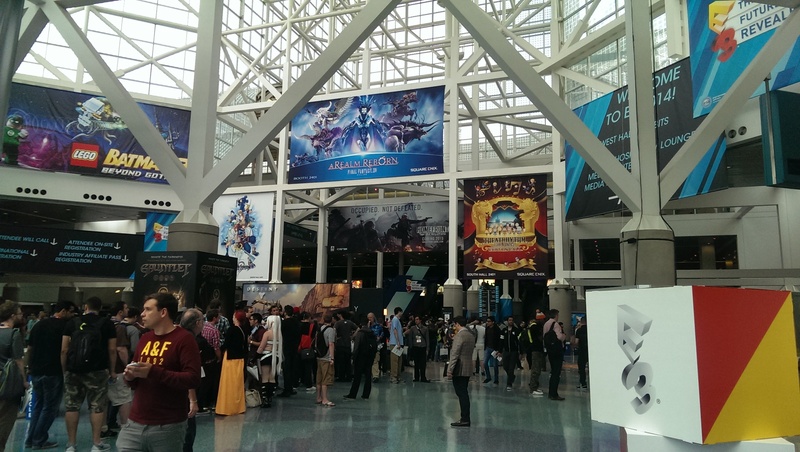 E3 2014 was my first time to the big show, and what a show it was. All three companies came out swinging with solid showings, highlighting a variety of titles that seem to have a great deal of potential. For Sony, I found myself most interested in their reveal of LittleBigPlanet 3 and Uncharted 4 (though I’m really hoping that installment isn’t the end of the line for the series). Microsoft wowed me with its Master Chief Collection. That’s the sort of fan service that I’ve only ever seen come from a company like Nintendo, but I don’t think even its ever done anything as ambitious as what Microsoft is attempting. Nintendo, though, ran away with the show, as far as I’m concerned. Nearly every game on its show floor was a must-have, and the lineup was packed with both familiar faces and pleasant surprises. All in all, Nintendo had the complete package, and it was very apparent. So, here’s looking forward to the rest of this year and beyond, and please check out my little gallery of pics, below! This was on display in Natsume’s huge Harvest Moon booth. Shaping up ok, so far! Splatoon was freaking awesome. Easily one of Nintendo’s best, new IPs in years. It’s not every day that I can say I raced up the face of a waterfall. Well, until I picked up Mario Kart 8, that is. The latest entry in Nintendo’s storied racing franchise will be keeping me busy scaling cascading waters for the foreseeable future, as it’s crammed with that and many more memorable moments besides. While Mario Kart games have never been known for resting on their laurels, MK8 has managed to take the stellar foundation built by Mario Kart 7 and multiply it by a factor of ten. The raw horsepower of Wii U has allowed Nintendo’s developers to let loose with a cavalcade of innovation and creativity that sets MK8 firmly in the upper echelon of the series. Not only that, but Nintendo has also produced one of the marquee experiences of this latest generation of consoles. 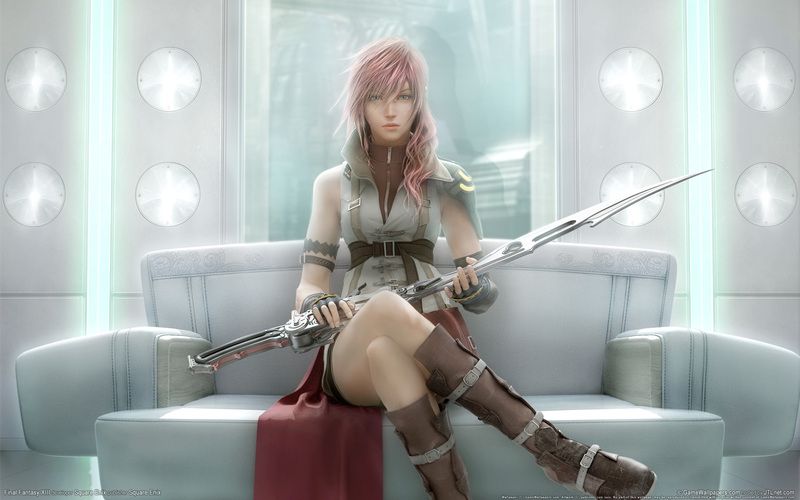 Graphics aren’t the most important aspect of any video game, but there’s no denying when something extra pretty has graced a television screen. MK8 stuns with brilliant lighting, rich detail, and some of the most ingenious art design the series has yet seen. Moo Moo Meadows blew me away with its dawn sky, a florid pink pocked with clouds and a low hanging sun, complimented by effervescent puffs of morning mist hovering over the racetrack. Titles like Super Mario 3D World and Pikmin 3 have been landmarks for what Wii U can accomplish graphically, but during my time with MK8, I couldn’t help but feel that it might be the most beautiful game on the system. There is so much to soak in from the environments alone that a person could spend hours racing and see something new almost every time. The tracks are so fully-realized and unique that they warrant having a Mario platformer built around them. I’d also like to point out the wonderful, fully-orchestrated soundtrack. MK8 sounds as great as it looks. All this beauty would be wasted if the track design didn’t hold up, and luckily it does, with ease. Following the train of thought that inspired Nintendo to release the series into the sky and sea in MK7, Mario Kart is now also devoid of the limitations of gravity. 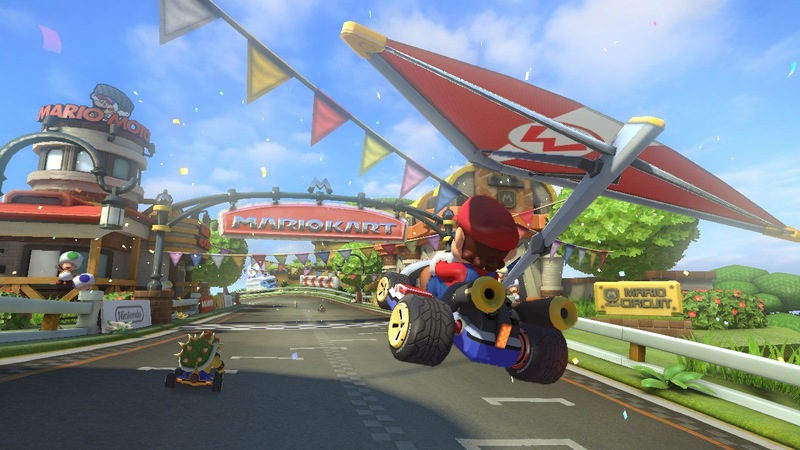 Anti-grav features prominently in MK8, and entire tracks are designed around the new mechanic. Courses like Mount Wario have a bevy of vertical inclines and corkscrews that simply wouldn’t have been plausible within past series installments. Unshackling the developers as Nintendo did breathed fresh air into the designers, who have in turn rewarded players with some of the smartest and most engaging race tracks in years. Anti-grav adds to the wow-factor of the game, certainly, but it also serves to spice up some of the racing stratagems that fans have come to know like the backs of their hands. Taking a cue from Super Smash Bros. Brawl, MK8 offers numerous control options. Motion controls, GamePads, Pro Controllers, Wii Classic Controllers, and Wii Remote and Nunchuks are all viable options to play MK8, and they all work great. Even Motion Controls, which I personally am not partial to, have been made more precise for MK8. Powersliding is much as it has been since Mario Kart Wii, but the re-introduction of coins on home consoles is a surprising and fun addition. Much like MK7, each coin collected provides a minute boost of momentum, while also increasing a racer’s baseline speed (which maxes at ten coins). The new items are also notable, with the Boomerang (which can be launched and returned three times!) and Super Horn (which obliterates Blue Shells!) being particular standouts. Oddly, there’s a major change to item pickups that left me scratching my head. Where previous Mario Karts allowed for many items to be held in perpetuity behind a kart, which then freed the racer to snag another item to use afterwards, players are now limited to a single item at a time. Gone are the days of dangling a Banana behind a racer and keeping a Green Shell in wait! What this contributes to game balance is questionable, as it’s been a series mainstay for years with little to no complaint. The omission isn’t horrible, but it felt extremely limiting and unnecessary. Also somewhat odd is MK8‘s roster; though there are 30 racers to choose from, there is an overwhelming number of baby racers, not to mention all of the Koopalings. I was thrilled to see characters like the Shy Guys and Rosalina, but the variety of past Mario Karts has been somewhat diminished. It’s a joy to see the Koopalings, no doubt, but combined with the other members of the roster, that’s a lot of turtles and tiny characters! 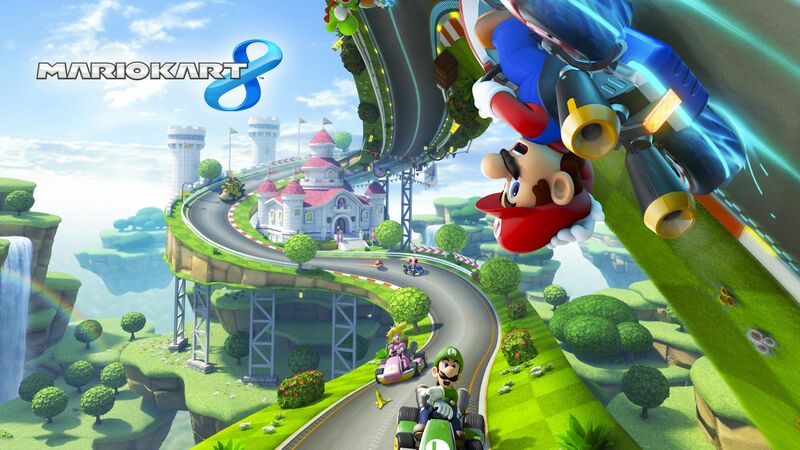 Nitpicks aside, Nintendo has hit another home run with MK8‘s online multiplayer. Matchmaking is a synch, and I experienced smooth and solid races. I do find it grating that Nintendo continues to pessimistically limit online connectivity via headsets and private matchmaking, but MK8‘s multiplayer is fun whether offline or on. Mario Kart TV is surprisingly entertaining, by the way. Whether by phone or console, it’s easy to run through the highlights of a previous race and post them online. I made an especially wicked turnaround at the end of one race, and was thrilled to be able to share it with fellow Mario Kart fans. I can only hope that a similar feature makes its way into Super Smash Bros. There is one aspect of multiplayer that has been butchered, though, and it’s Battle Mode. Custom arenas have been replaced by a small selection of stock tracks, where players are tasked with zooming around aimlessly trying to pop one another’s three balloons. Whatever the reason for the mode’s diminished capacities, it’s a major letdown. MK8 is easily a top three contender for best Wii U game. Outside of a few niggling oddities and small blemishes, the pure bliss of soaring across MK8‘s wonderful courses is as close to gaming perfection as it gets. I was enveloped by the sheer spectacle of it all, and have found playing has become almost compulsory, at this point. MK8‘s online multiplayer will inevitably prove to be as addictive as Call of Duty’s for most fans, and Mario Kart TV is a nice addition that suits the series well. Wii U’s library continues to grow, and with a bloom like MK8, it’s hard to imagine anyone not wanting to join the fun. Getting tired of the semi-hiatus here at Retro(spective)? (All five of you, I mean). Me, too! I did warn everyone though, so I’m not losing too much sleep over it, but still, nothing worse than dead air. What can I say, school has been a beast lately, Nintendojo (which you all should be reading) always has something percolating, and well, I can’t write about games if I don’t play them! Summer approaches, though, so expect things to start getting livelier as we move deeper into June. Mario Kart 8 will be getting the old review treatment, and expect the same for Tomodachi Life, too. Beyond that, E3 is going to be huge. What I don’t post for Nintendojo will be here, so look forward to hands-on time with whatever amazingness lies in wait for this year’s show. I’d also like to point out, Retro(spective)’s one year anniversary is also fast approaching! Maybe I’ll… give something away in celebration! Exciting times await, dear readers! I hope you’ll all be along for the ride.